Last week I spoke of the feathered cloaks of Polynesia, specifically, New Zealand. I mentioned that while there are many similarities in the cultures of the various island groups within this region, each nation has developed their individual identity. Today we return to the Maori Arts Gallery in Wellington, New Zealand to see a contemporary example of a flax ceremonial skirt. 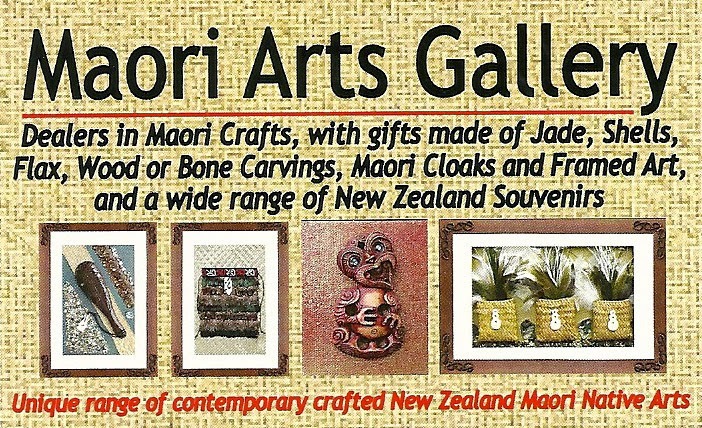 Maori Arts Gallery, Boatshed 2, Waterfront Walkway, Frank Kitts Park, Wellington, N.Z. 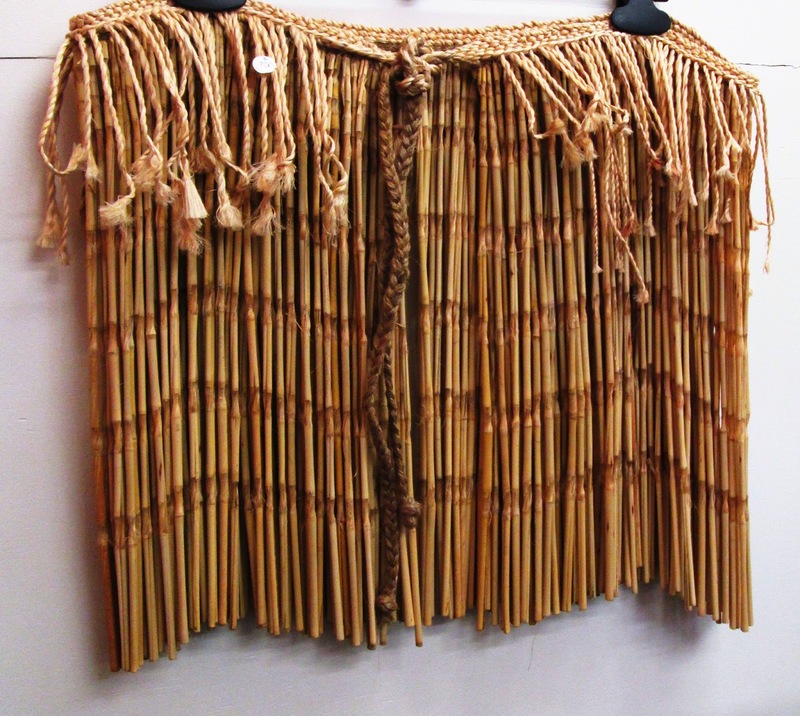 One of iconic garments of Hawaii and Tahiti is the grass skirt. Every luau features dancers performing the hula. The dancers sway with graceful movements and their grass skirts perfectly mimic the swaying motions of the palms and the ocean waves. In New Zealand,. 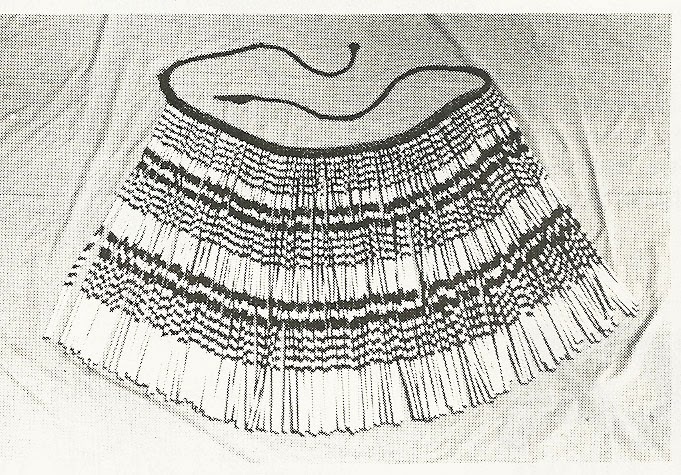 these ceremonial skirts, piupiu, are worn by both men and women. Unlike the long, grass fibers of the other Polynesian skirts, those of N.Z. are made from the long, tightly grouped strands of tubular flax. These patterned fibers hang from a woven waist band. The preparation of the flax involves scoring each strip of flax leaves with a dull knife according to the traditional designs, centuries old. . Care is taken to only penetrate the green layer of the leaf and does not penetrate to the inner fibers. In olden times a mussel shell was used to scrape and rub the scored area to expose the white flax fiber beneath. The resultant design is alternating bands of green and white. For a skirt with a waist of approximately 29 inches, nearly 128 scored and scraped fibers are required.. The strips are plied and tied together in preparation for boiling which will remove the chlorophyll (the green bands). As the strips dry they curl into long tubes. Dyeing comes as the next step. Only the exposed fibrous areas will accept the dye, the resulting pattern is alternating black (dyed) and natural white bands.